First, you have to write it down. Clearly. In pencil, because it may change. You’ve got to develop a “shorthand” that is easy for you to remember. A script doesn’t give you enough space to write full sentences, and you can’t be reading a full sentence about your movement while you’re saying your lines. Using an “X” for cross, as well as the usual directionals (“DR” for downstage right, etc.) are obvious choices, but you may need to invent abbreviations for set pieces or kinds of movements (jump, run, stand, etc.) I’ve sometimes drawn a floor plan on the stage and used numbers to indicate locations I am to be on certain lines, and noted those numbers on the lines in question. I’ve also used arrows. How you note your movements is up to you. The point is that they should be legible (no scribbling you can’t decipher later); clear in intent; and complete. 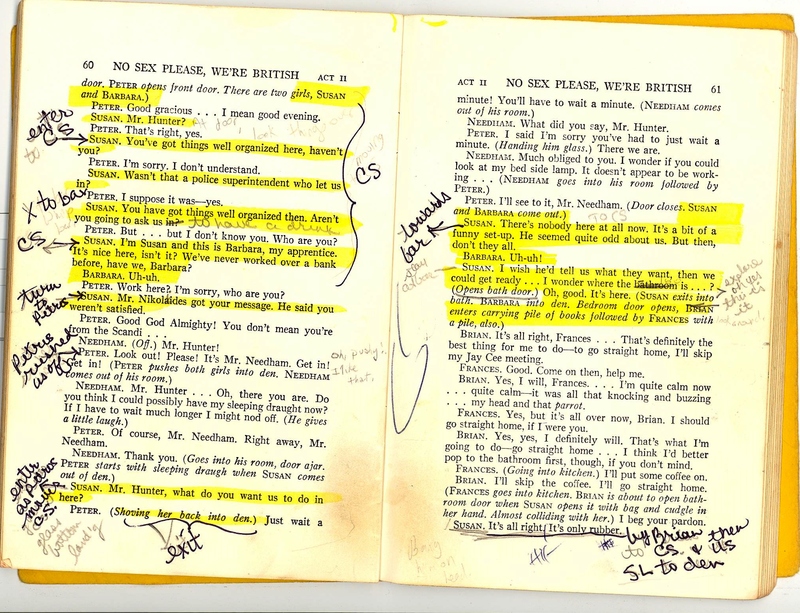 You may need to stop the rehearsal’s forward progress to make notes in your script. This is perfectly all right; it saves everyone time later, so no one objects to the stop-and-go nature of blocking rehearsals. Just make sure that you get everything written down, because I promise you, you won’t remember the things you don’t write down. When you get home from rehearsal, walk through your movements in your living room. Don’t worry about your lines. Just make sure you know the movements. Notice what the line is that you’re moving on, but jump from one movement to the next. Skip all of the dialogue that happens while you’re stationary. Don’t just read your notes. Physically move through the pattern. Twice. If you are very active in a scene, you might want to break the scene into smaller pieces; pieces that allow you to remember a number of consecutive movements, so that the second time through goes fairly smoothly. If you can, get to your next rehearsal a few minutes early, and walk through your blocking again in the rehearsal space. In all likelihood, you’re blocking a different part of the play and won’t be running the scenes from the previous night, but you want to revisit the blocking while it is still fresh in your mind. If you can’t get to rehearsal early, stay for a few minutes at the end. If you don’t do these little walk-throughs, then by the time you rehearse the scene again, you’ll have forgotten much of your blocking. But if you DO do them, you’ll gain comfort with your movements early in rehearsals, which will free you up to do the more important (and fun) work on your character! To read Blocking the Play, go here. To read Part I, go here. This entry was posted in Acting, Action and tagged Acting, acting technique, Actor, Blocking, Community Theater, Rehearsing. Bookmark the permalink.